Governor Brown signs SB 844! Big victory for Clean Money activists! Here's the email message we sent out to Clean Money supporters after the October 3, 2014 signature by Governor Brown of SB 844. GREAT NEWS!!! Tuesday there was a BIG WIN for campaign finance transparency. After thousands of you signed petitions, emailed, and called, Governor Brown signed SB 844, the bill authored by Senator Fran Pavley to make it easy to see online who's spending money for and against California propositions. "Don't EVER think grassroots activism does not pay off! Thanks to a massive effort by the California Clean Money Campaign... Senator Pavley's SB 844 was signed today. Now voters will have clear information about who is spending big bucks for and against ballot measures! Woohoo! A win for the people and not the special interests!" Please thank Governor Brown for signing SB 844 and urge him to help pass the California DISCLOSE Act in 2015! SB 844 is a modest step because it doesn't address the biggest campaign disclosure problem, the fact that political ads are allowed to deceive voters about who paid for them. So we'll still need to pass the California DISCLOSE Act next year. Nonetheless, SB 844 is very important because it requires the Secretary of State to create an online page with the total amount raised and the top ten funders for and against each proposition. Just as important, the official ballot pamphlet will include a link to the page so it's easy to find. More than 11,000 people signed our petitions. 256 pages of petition signatures delivered to the Governor's office. More than 4,000 people went to the Governor's website to make official comments. Hundreds of phone calls made it through urging him to sign SB 844 -- thanks to those of you who waited on hold or kept calling despite the lines being jammed! As with almost all campaign finance victories, passing SB 844 was a major coalition effort. 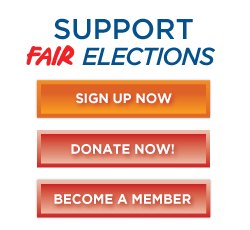 The California Voter Foundation took the lead in working with Senator Pavley's office to craft the legislation, along with Maplight and other advocates. Thanks also go to other the organizations that joined the California Clean Money Campaign in supporting SB 844: California Common Cause, California Church IMPACT, California Forward Action Fund, Label GMOs: California's Grassroots, League of Women Voters of California, Lutheran Office of Public Policy - California, Progressives United, and SEIU California. By signing SB 844, Governor Brown showed he heard all of you loud and clear!